This entry was posted in Journal, nature, Watercolor and tagged home, Mary Oliver, nature, winter by Jean Mackay / Drawn In. Bookmark the permalink. Yes…the work of artists and poets is much the same. Hope you are doing okay. Sending you good wishes. And the work of photographers (though some would dispute this). Beautiful. On the day she died, I sketched a Wisteria pod.. then I forgot it on my desk. Yesterday as I was working, it suddenly snapped open, startling me – I had to smile. She certainly touched a lot of people Thanks for sharing your story. Love her poetry and your roadside moment. So nice to think of inspiring so many people with poetry and art. Thanks for posting. p.s. will have to wait a few days since it is minus 3 degrees here in MI today! Yes. I’m inside today, too. I have to get out to shovel, but will leave my sketchbook indoors. Stay warm! Your beautiful art and words remind us all that Mary Oliver left for us. You are welcome, Peggy. Honored. The geese were a surprise. It was absolutely empty, cold and quiet along the road; then, suddenly, a great racket of geese flew over. A perfect sound. Lovely sentiment and lovely drawing. I didn’t know about Mary Oliver, but now I will surely look for her poems. Did you actually draw & paint while outside? Or maybe just draw & paint inside? Either way, it’s inspiring, as always. Definitely look her up! I drew outside and painted inside. I thought I’d last longer, but I only made it about 30 minutes. Quick sketching pays off! Today, it’s even colder (and a foot of snow covered everything I sketched yesterday). I’m in! Post Script: I just read “How I Go to the Woods”. Thank you for leading me to Mary Oliver. Thank you for your poetry of line and colour and for the introduction to the beautiful words . I like your phrase “poetry of line and color” — that’s a nice compliment. Thank you! Thank you Lin– so glad it resonated with you. “Learning to be astonished” – exactly, that’s it! Isn’t it?! I love that phrase. What a beautiful tribute to this poet. I’m embarrassed to say I’d never heard of Oliver, but am so glad to read your post so I can learn more about her work. You’ll like what you discover. I’ve been looking into her work all afternoon, and you are so right – I absolutely love what I am discovering. Ordered one of her books just now. What a pity that I was not aware of her before this. Thank you for introducing me to this remarkable poet and thinker, Jean. Fantastic! I’m glad to have made the introduction. I’m glad I discovered your blog a while ago so that I could see your beautiful, detailed work. Your post on Mary Oliver is just icing on the cake. during this thundering blizzard storm. To load up around every tree bush rock to make beautiful cornice sculptures. White fog breath hovers over homes, over hope. And alive in birdsong (same thing). You are probably the only one, now that Mary Oliver is gone, to find beauty in roadside grasses in freezing temperatures! And you did make a lovely painting. You are quite amazing! You are very sweet Nancy. But even I have my limits– today was 4F and I stayed inside, painting wrens. How do you create your beautiful text? Is it with ink and a fountain pen, or a calligraphy pen or some other way? I typically do not use a fountain pen in my journal because I don’t want the fuss. I use a Micron black pen (size 02) for drawing and text and build up the thicker strokes of the letters. 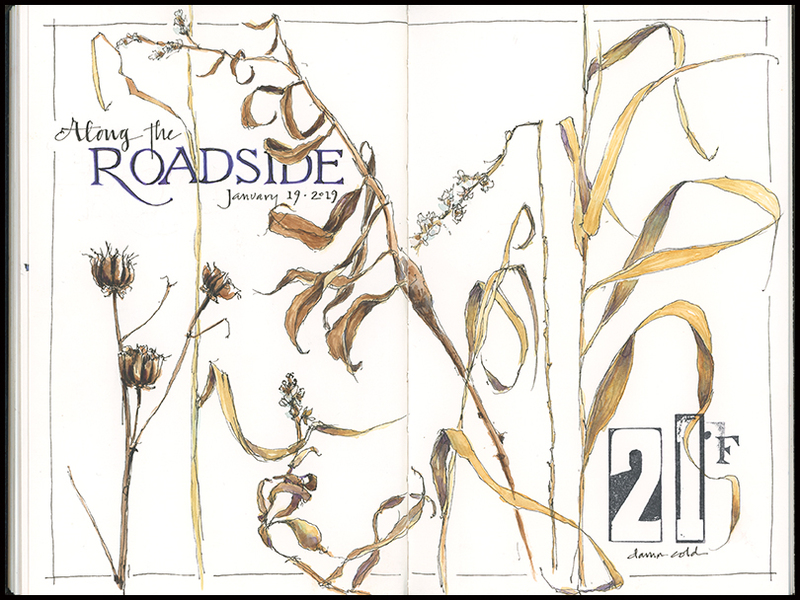 On this page, I did the word “Roadside” in watercolor with a size 1 brush. This was tricky, and I wasn’t entirely happy with the result. It’s much harder to get a consistent stroke weight with a brush. I have also used a dip pen and loaded it with watercolor paint. Had I thought of that, I probably would have done that here, as you get more control. So, as you can see, there are lots of options; experiment to find the ones that work best for you! Well, your text always looks so beautiful. And, you are so good at combining it with your artwork. That is always my issue. Mine always looks very separate. Like an afterthought. How do you always blend it in so well? Gwen- I think of text as a graphic element. Once the drawing/painting parts of the page are complete, I look at the remaining spaces and consider what I want to say and how best to integrate it. That may be just a single word or it may be a poem or quote, etc. I also think about the style of the text in relation to the drawing. There’s no one right way to do it, but adding text is not random. It is a thoughtful addition to finish the page and further express what I’m trying to convey. Hope that helps! What a lovely idea in tribute to Mary Oliver. We’ll call this an interim blog post. One of my favorite poets, Mary Oliver, just passed away, and artist and naturalist–and fellow blogger–Jean Mackay, has written this wonderful tribute to her. Let me share with you, in closing, one of Mary Oliver’s bird poems. I chose this especially, and you’ll soon see why. Happy Valentine’s Day, and thank you, as always, for reading.